Onboard the Norwegian Pearl you are promised a cruising experience you won’t forget. There is a range of stylish, comfortable cabins, so it won’t be hard to find one that suits your every need. For casual dining there is a selection of cafes and grills, perfect for a relaxed evening after an action-packed day. Norwegian Pearl also offers specialty cuisine from around the world, at the Moderno Brazilian steakhouse or the authentic Japanese Hibachi restaurant. There’s something for everyone when it comes to finding activities for your perfect day at sea. For a day of pampering wander into the world class Manadara Spa and choose between a range of treatments such as a bamboo massage. There’s a fitness studio and an outdoor running track to get your work out in or chill out in one of the six outdoor hot tubs. 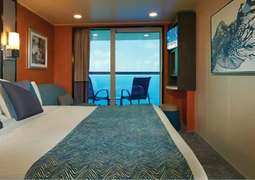 The Norwegian Pearl has 32 different cabin categories available to you, including inner, outer and balcony cabins, as well as a variety of luxury suites. This includes the Haven suites with 24-hour butler service, concierge service and private sundeck. 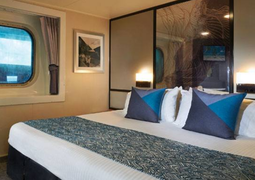 Each cabin is individually furnished to meet the individual needs of each guest. Every passenger is bound to find their perfect home away from home. 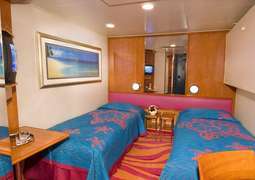 As with cabins, you also have a world of possibilities when it comes to dining options. A grand total of 12 restaurants and 11 different bars and cafés will cater to your physical well-being with diverse and delicious menus. 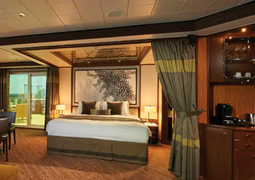 Cagney’s Steakhouse, the Asian-themed Lotus Garden or Le Bistro with its fantastic French cuisine are a few examples of where you'll find top class cuisine on board. Boredom is the only thing you won’t find on this ship, thanks to a wide variety of entertainment programmes. For example, let the Stardust Theater take you on a tour down Broadway with show-stopping performances, try your luck in the Pearl Club Casino, or have a ball in the Bliss Ultra Lounge as spectacular lighting effects accompany neon-colored bowling balls as they cruise down the lanes. If you’re looking for a quiet afternoon, you’re more than welcome to browse the endless collection of world-class literature in the library, or take a stroll through the art gallery. Those hoping to stay active along with feasting and relaxing have many opportunities to do so on board. Feel free to visit any of the game courts, work out on one of the modern exercise machines in the Body Waves Fitness Centre, or run a few laps around the ship-encompassing athletic track. Then cool down in the waterpark with everything from deluxe Jacuzzis to kid’s splash areas. An equally wonderful alternative would be to relax in the South Pacific Spa and Beauty Salon, where the well-trained hands of professionals will treat you to numerous wellness treatments.